Spoilers And Rumors For Civil War, Fantastic Four And Agents Of SHIELD! There’s one character from the Green Arrow comics that Arrow will never touch. Who is Matt Smith playing in Terminator Genisys? Find out where Hannibal could go after season three. Plus our first official look at the X-Files relaunch, and the first clip from Fear the Walking Dead. So many spoilers! Salt shakers at the ready, of course, but Latino Review is reporting that the two properties could potentially team up for a crossover film in 2018. 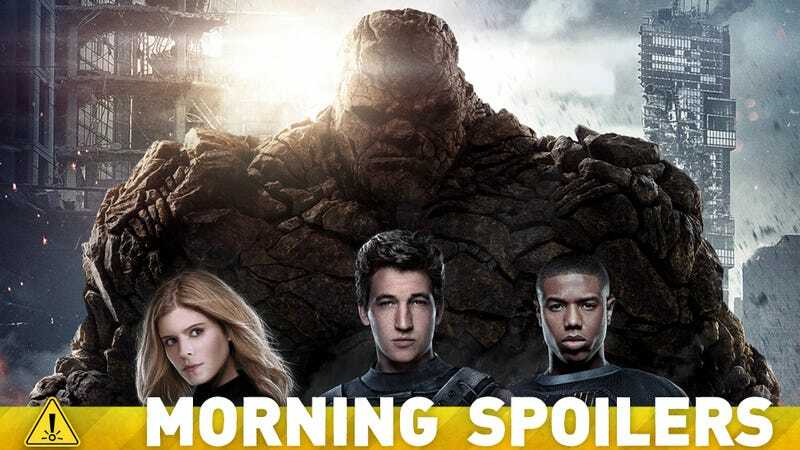 But these plans reportedly depend on both Fantastic Four and Fantastic Four 2 being successful, and also X-Men: Apocalypse not underperforming. I loved playing Ross the first time because I was able to try and create an ego as big as the monster he was chasing. And one that was as warped too. [Ross in Civil War] is different because it’s a different style. It’s a more modernized style. And what they’ve done is they’ve taken a character who was the Ross from the older film and made a new version. This is a much newer Ross. A much different Ross. And I liked that a lot. I haven’t had a lot of time to understand it, but I’m doing the best I can. And they haven’t fired me yet. What can you tell us about your character? Who are you? Who am I? Well, my name is Matt. And I’m very excited to be a part of the new Terminator franchise. Obviously, I can’t talk in too much detail about the specifics of my character, but needless to say I have close interest and links to John Connor. So yeah. What else do you want to know? I love football! Are you afraid of Skynet? Am I afraid of Skynet? Everyone’s afraid of Skynet, aren’t they? Again, we’ll have to wait and see the actual specifics of what I am. But it’s going to be interesting, is all I can say. It’s a very interesting part for me to take on, and different to the stuff I’ve done in the past. There has been interest from a few different parties. It’s all about gauging how much of an interest and there’s certain avenues that I know we wouldn’t be able to do, for instance Netflix because our deal with Amazon precludes a Netflix component. So it’s not a good deal for them to make even though they’ve been so kind in terms of their enthusiasm for the show. The contract limits what they could do with it. The studio is talking with other venues to see how serious their interest is. Does that include Amazon since it has the rights to the first two seasons? Amazon makes the most sense, honestly, because they have been great partners with us for three seasons and we are exclusively streaming on Amazon. It feels like they have the interest in the program. What can you hint about what you had planned? Oh no, I can’t give that away! That would ruin the third season ending. It all ties in. The end of the third season is pretty dramatic, so we can’t give that away. Will there be closure for fans with that ending if the show isn’t picked up elsewhere? There will be a huge move for the show and it will be as satisfying an ending as it would have been in the first two seasons. So if we had ended with Will taking the fall for Hannibal’s crimes that would be a satisfying ending. Or if Hannibal is actually laying all of his friends to waste and walking out in the rain, that would be a satisfying ending. And this ending for season three would be as satisfying. Only four of them live. If you’re dead, you’re dead and only four of them live. The second season is the four remaining survivors playing the same characters going to a new ‘Scream Queens’ venue. Then we bring in other people and the death party starts again. I guess what I can say... is what I know from the end of season two. The rogue element of the Inhumans has been more or less defeated and it seems like Coulson’s trying to bring his beloved Skye, who is more or less fully realized as Quake, into a new super secret team of powered agents, which very much sounds like something I know from the comics as ‘Secret Warriors,’ which is very exciting. It’s a really cool kind of rogue... quiet part of S.H.I.E.L.D. that gets very involved in some of the goings on that happen around ‘Civil War,’ which is the ‘Captain America 3’ film that’s shooting right now, which is a truly great chapter in Marvel Comics. You start filming in September? Yeah. Sort of the rough answer is fall–September, October. That’s when they anticipate beginning the process. That’s what I’ve heard to this point. If you’ve read any of it can you share any initial impressions? I have read a couple but I can’t share anything with you. I would love to, believe me. I can certainly say without hesitation, it’s going to be amazing. After Harold attempts to break past the fence surrounding Wayward Pines, Ethan interrogates him about other insurgents who have gone off the grid. Meanwhile, Amy’s (guest star Sarah Jeffery) health takes a turn for the worse, Nurse Pam encourages Theresa to investigate Plot 33, Ben’s teacher, Megan Fisher (guest star Hope Davis), advises Ben to speak publicly about the current events effecting Wayward Pines and Ethan reveals the truth about the town to the residents in the all-new “A Reckoning” episode of WAYWARD PINES. Finally, Entertainment Weekly have a gallery of exclusive pictures from the return of the show. Additional reporting by Diana Biller and Charlie Jane Anders. Top image: Fantastic Four.